It's not much to write home about, but the number of U.S. firms whose stocks are publicly traded on stock exchanges in the U.S. increased for the first time in years in 2018. Admittedly, the increase of 2 firms from 3,484 in 2017 to 3,486 in 2018 doesn't really qualify as a dramatic reversal for the nation's stock exchanges, which once counted no fewer than 7,322 firms among their actively traded listings back in 1996. 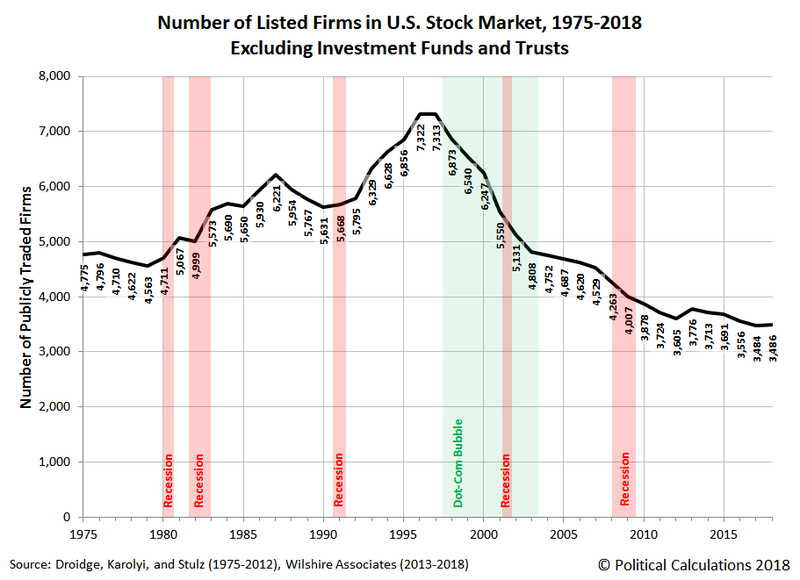 But it is the first real reversal that we've seen in these numbers in more than 22 years that isn't attributable to a change we made in the data sources we track, where the data from 2013 onward is taken from the number of firms that are included in the Wilshire 5000 total market index. Who knew that 2018 was the year that the U.S. stock market stopped shrinking? And will that reversal of trend continue next year? Craig Doidge & G. Andrew Karolyi & René M. Stulz, 2017. "The U.S. listing gap," Journal of Financial Economics, vol 123(3), pages 464-487. DOI: 10.1016/j.jfineco.2016.12.002. (NBER Working Paper No. 21181). Wilshire Associates. Wilshire Broad Market Indexes, Wilshire 5000 Total Market Index Fundamental Characteristics. [2013, 2014, 2015 (for month ending 06/30/2015), 2016 (for month ending 06/30/2016), 2017 (for month ending 03/31/2017)]. Wilshire Associates. Wilshire Broad Market Indexes, Wilshire 5000 Total Market Index Fundamental Characteristics. [PDF Document]. 29 June 2018.